Examples, solutions, videos, and lessons to help High School students learn to add vectors end-to-end, component-wise, and by the parallelogram rule. Understand that the magnitude of a sum of two vectors is typically not the sum of the magnitudes. I can add vectors graphically using the Parallelogram Method. I can add vectors using the Parallelogram Method, Law of Cosines and Law of Sines. I can add vectors graphically using the End-to-End method. I can add vectors using the End-to-End method, Law of Cosines and Law of Sines. I can add vectors using the Component Method. 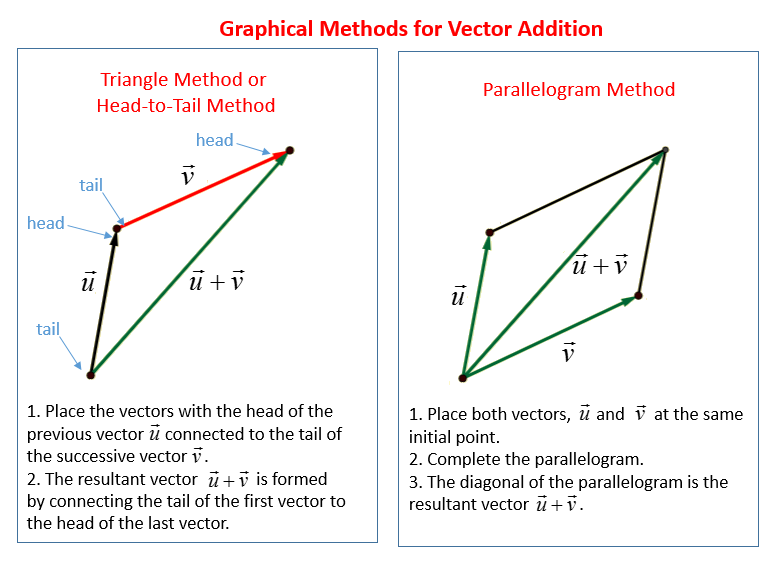 The following diagrams show how to add vectors graphically using the Triangle or Head-to-Tail Method and the Parallelogram Method. Scroll down the page for more examples and solutions. This video shows you how to add vectors graphically using the parallelogram method. A problem of finding the resultant of the addition of two force vectors, using the parallelogram method (a geometric solution involving the law of cosines and law of sines). This video shows you how to add vectors graphically using the tip-to-toe method. How to Add Vectors Graphically (end-to-end). Add two vectors graphically using the head-to-tail method. A problem of finding the resultant of the addition of two force vectors, using the head-to-tail method. An example of how to add two vectors by using their components. This video goes through breaking them down, and adding the components. How to Add vectors using components (part 2). A displacement problem is presented showing how to add vectors together using the component method.